Bryn Halbrook had always seen the glow. But it is only when her best friend dies that she discovers the meaning of those beautiful golden auras--Death. Alone, lost in the foster system, she struggles to understand who she is and why she was cursed with the ability to see the soon-to-be-dead.The new foster kid, Aidan, isn't helping any. Mr. Perfect seems to fit in no matter what, making her feel even more pathetic. But when his affections turn to her, Bryn finds him hard to resist. Impossible, actually. A mystery himself, Aidan disappears, leaving behind a broken heart and a mysterious book that suggests Bryn might not be entirely human.Bryn stands at the threshold of a journey of discovery. Will destiny help her find herself, find her purpose and her place in a world in which she'd never belonged? 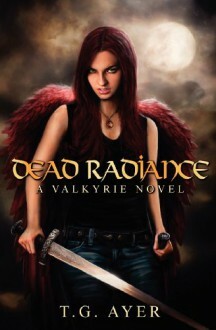 I don't know why there aren't more really good Valkyrie stories out there but I find that I am liking them more and more. TG is fantastic and Dead Radiance is phenomenal! I read the sample & liked it well enough to purchase the book. Boy, what a mistake that was. The whiplash-inducing romance & flat, dull characters sunk this ship, fast.